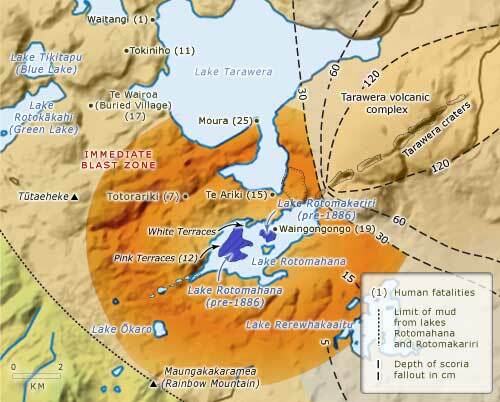 This map shows the main area affected by the Tarawera eruption, and gives an estimate of the number of deaths at different localities. The northern end of the Tarawera rift sent up a column of scoria and ash, similar to that of Vesuvius in 79 AD. The eruption at the southern end of Tarawera was phreatomagmatic – the result of contact between hot magma and water – and covered the country with a hot, fast-moving blast of fragmented rock that destroyed everything in its path. Now the Pink and White Terrace locations have been discovered, this map is obsolete and should be updated.